This post is brought to you by Movemints and The Motherhood. All opinions are my own and not swayed by outside sources. As a dentist that treats a lot of kids and with a husband who is an orthodontist, we always get asked about clear aligner and clear aligner costs. Of course, we are huge proponents of clear aligners in our household and my husband is a big provider, so much so that we will be attending the national conference this fall. The #1 complaint we hear is patients who can’t adhere to not putting anything in their mouth when they are wearing clear aligners. Even something like mints can’t be eaten without taking out the trays. Now though we found out about an awesome new product called Movemints Clear Aligner Mints. 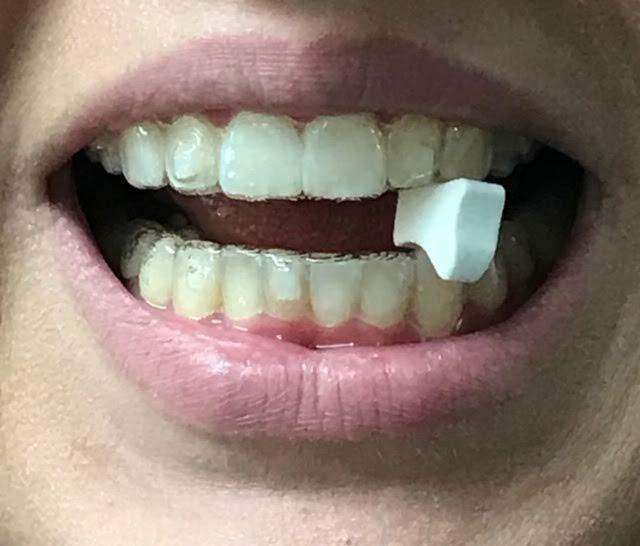 Movemints are the mints just for those who wear clear aligners and the best part is the patients don’t need to take out their trays. A true win for both the patient for eating something and a win for the orthodontist because this allows patient compliance! With the invisible braces cost, you want to make sure you are putting something in your mouth that will not mess around with your treatment. If you are in clear aligners, you can now improve your experience during the clear aligner treatment journey. There is no better way to create a more enjoyable, fresher smile journey. Movements are a discreet and convenient way to comfortably seat clear aligners when you are on the go while freshening your breath and fight dry mouth. These mints were designed by an orthodontist who specialized in Invisalign and has patented grooves that fit between your top and bottom trays. 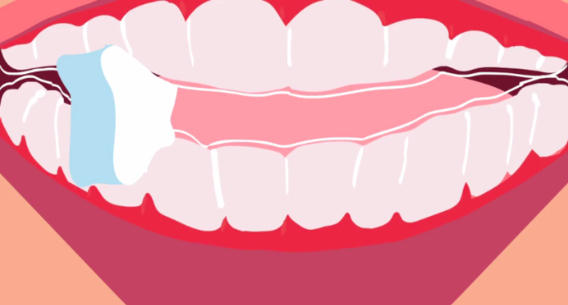 These grooves can help you guide your aligners in place without having to chew on those plastic chewies that patients often receive when beginning treatment. Movemints can help alleviate invisible brace pain as well. Most Invisalign patients use chewies(which is a small spongy material) to do this but this is unsanitary. Putting your fingers in your mouth during flu season is not something any of us want to do. With Movemints, you can get the same benefits as the chewies but no need to put your fingers in your mouth and best of all, they taste great. Can you have Mints with clear aligners? The answer is YES! But just these Movemints! 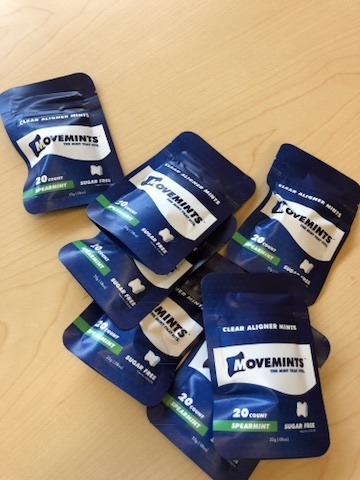 Movemints are sugar free, gluten free and vegan. They are meant to wear with your clear aligners. The key ingredient in Movemints is Xylitol, which is a naturally occurring sugar substitute that can help prevent dry mouth and is thought to prevent tooth decay. It is also low calorie and diabetic friendly. Movemints Clear Aligners Mints provide a great substitute to gum chewing(which you can’t do with your trays) making it easier for patients to wear their daily 22 hours of aligners a day. Movemints help to keep the trays clean while wearing them. 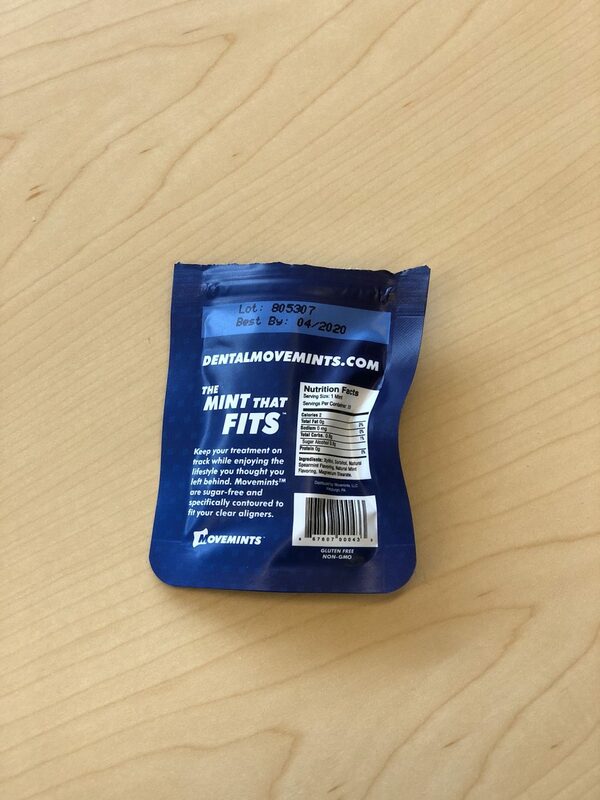 Movemints are a great accessory to have in your on the go bag. They are delicious and affordable. If you have clear aligners, definitely give Movemints a try today. My husband has been suggesting these to his patients and so far they have been huge hits in his office! These sugar free hits are now available to try out at Pezza orthodontics and you can order online here: Movemints Clear Aligner Mints. Also visit Dental Movemints to sign up for their mailing list and get a 20 percent off coupon plus other special offers. *Movemints have not been evaluated by the FDA. Great giveaway! I’d like to try the mints and I think they’d be good for my kids in braces too! These would be perfect to carry in my purse and my grandson could use them with his Invisalign braces. I would love these for my sons who have braces. They would really like something like this in place of gum. I like these because one they are sugar free . Two, they make it easy for braces to stay clean. I definitely like that they’re sugar free. I like that these are sugar-free. I like that it is made with Xylitol, the natural sweetener! I remember how my mouth felt when I wore the old style of braces, and how my breath could smell, even after a good brushing. My daughters have been going through the braces thing, too, with my youngest still needing something done and we’ve been looking into the inviliner type for her. I like that these can help freshen breath – that was my biggest issue when I had my braces. I really like that they are spearmint flavored. I like that they freshen breath and fight dry mouth. I like the convenience the most. Sugar free, so good for any time. I like that Movemints allow you to wear clear aligners or retainers with confidence and go about your day without feeling self-conscious about bad breath. I like they help with dry mouth and they are sugar free. I love that both kids and adults can chew these while wearing braces. Plus I love the idea of a minty flavor! I like that these help with dry mouth and that they are sugar free. I like that they help tighten trays and freshen breath! I like that this product is sugar free. I like that they fight dry mouth. I love that it freshens breath and is sugar free too! I like that they freshen breath and are edible. I like the fact that these are gluten-free the best! I like that these help with brace discomfort and help improve the fit. I visited the Mini Pumpkin Cheesecake recipe post. Love this idea and it being in mint also and helps with dry mouth as well. Cool! I like that they are sugar free. I love that they are portable, which means you can take them with you. The thing I like the best about Movemints is that they are sugar free. My daughter has to wear her retainers most of the day. This would be great so she doesn’t have to remove them and have the chance of losing them. I like that they’re affordable. Love me a good spearmint-flavored mint! But could do without the fake sugar. Bleah! Small, convenient, and sugar free–sounds great! I like that they are Sugar free and designed by an orthodontist. Freshen breath, fight dry mouth, and comfortably seat clear aligner trays.I think these are all awesome! I like them because they help secure the aligners properly and freshen your breath at the same time. I like that they not only freshen breath but also fight dry mouth which I struggle with. I love that they are free of sugar! My niece with braces would love to try these. I love that they are affordable! Xylitol in Movemints is low calorie and diabetic-friendly. Interesting and good for people with dental stuff. I like that they are diabetic friendly. I learned Movemints are the only edible accessory that helps you stay on track with your treatment plan. Improve the comfort and enjoyment of your smile journey with a discrete way to perform chewing exercises that soothe teeth and gums. Best of all, Movemints are sugar free and sweetened with Xylitol to promote oral health, freshen breath, and fight dry mouth. I like that they are safe for teeth and sugar free. I like them because they are sugar free so I can give them to my daughter who wears braces. I like that it aligns teeth. Both of my daughters need this. I have 2 daughters and I love your post DISNEY’S #DREAMBIGPRINCESS CELEBRATION FOR INTERNATIONAL DAY OF THE GIRL! I like that they are sugar free, gluten free and vegan. I visited Solo: Take Flight with the Millennium Falcon! These are great…wish they were available when i had mine on. I like that these freshen your breath because aligners can get funky smelling after wearing them for a week. I like that they are sugar free and that they can be used with all aligners. These being sugar free would make them perfect for my kids!!! I would like these for my granddaughter who has braces. I have two sons with braces so this would be great for them! I like that they are sugar free and fight dry mouth. Thanks for the giveaway! These would be perfect for my son in braces! i like that it fights dry mouth. Love that they are minty and do a job. I love that they are sugar free. These are a great idea. I have seen my kids use the eraser on their pencils to do this and it grosses me out. I think I will get them each a pack. What I like most about them is that they are unique! I love that they are sugar free! natural, breath-freshening power of mint! This product is good for discreetly adjusting aligners without drawing unwanted attention. it looks like a cool product, i love that they are sugar free. I like that they freshen your breath and are safe for your teeth. I like that movemints are sugar free and help freshen your breathe. I like movemints because they are sugar free. I love that they’re sugar free and you can have them with braces. I love that they are sugar free!! I am a diabetic so Movemints being sugar free is wonderful. They will also be great for my nephew who has braces. I like they are sugar free since I am diabetic. That they are brace and kid friendly. I like it that people can use the mints with Invisalign braces. I like that they keep my breath fresh and are sugar free. I like how they work with invisible braces. I like how useful they are and keep your braces clean. I like that they are sugar-free and that Movemints are an edible accessory that helping me to stay on track with my goals. I visited the What Is Skincare With Heart? Alana Mitchell Skincare post. I did not see a box in the widget, so I am listing the visit here in the comment. I love the fact that these are sugar-free and can be beneficial to the clear aligners. I like that it’s sugar free. I like that these mints are sugar free. I like that Movemints can help alleviate invisible brace pain. Very cool! I like that they have patented grooves fit conveniently between your top and bottom trays and are hard enough for long lasting enjoyment.